Dan Harms, a well-known scholar of Western magical traditions, has recently published a brief review of my book, Arguing with Angels. Harms will perhaps be best known as a connoisseur of Lovecraftiana, having co-written The Necronomicon Files with John Wisdom Gonce III, and published the Cthulhu Mythos Encyclopedia a few years ago. Despite being generally positive, Harms also finds that the book had a larger potential which it did not fulfill, and he points to a few omissions that he would have liked to see addressed. I will allow myself a brief response, as I find that Harms’ questions are important and likely to be addressed by other attentive readers with some background knowledge of the topic. Arguing with Angels is, to begin with, a book that covers a pretty long time span, and deals with a number of different historical contexts, so it shouldn’t be surprising that some readers will be left wanting for more in certain cases. Harms mentions two cases in particular, one, so to speak, in each end of the historical narrative. To begin with the earliest example, Harms would have liked to see a proper discussion on the Enoch figure, which could “have helped the reader with regard to the Biblical roots of Dee’s project”. The Biblical figure of Enoch, the patriarch in the seventh generation after Adam, who according to Genesis was taken to heaven and “walked with God”, and according to the apochryphal Book of Enoch acted as a mediator between God and the fallen angels, and, who according to certain Jewish mystical traditions was apotheosised by transforming into the archangel Metatron, does indeed constitute a context for Enochian magic. Besides that, he is a fascinating mythological figure in his own right. However, the most fascinating material about Enoch was simply not available to Dee: the Book of Enoch did not survive in the West, and only became available to European scholars in 1773, when Scottish adventurer James Bruce returned with three copies translated into Ethiopian that he had presumably plundered from a monastery in Abyssinia. Not adding a longer discussion of Enoch was, however, a conscious choice. Why? Because the relation between Enoch and Dee & Kelley’s angel conversations has typically been made into something that it was not – a trap which I wanted to avoid. In fact, the argument could be made that the term “Enochian” is a bit of a misnomer for the magical systems, language, and metaphysical speculations they “received”. While discussions of Enoch appear in the angel diaries, he is only one exotic reference among many others. Enoch was rumoured to have been the previous person to have known the secrets that were revealed to Dee and Kelly, for example, but their ultimate source was divine. The language, furthermore, had also been known to Enoch’s great-great-great-great grandfather: Adam. At any rate, in the first chapter on Dee and Kelley’s conversasions, it is more pertinent to focus on the actual immediate historical contexts, and what is known about Dee’s intensions, agendas, and use of sources. In that context, a preoccupation with Enoch is not all that important, except as a mythological example of someone who had achieved an unusual communication with God and the angels. Enoch was, however, far from alone in that achievement: other Biblical examples include Jacob, Esdras, Daniel, and Tobit. Ultimately, the contexts of natural philosophy and “low-culture” catoptromantic practices are much more important for understanding where Dee’s angel conversations come from. The second omission Harms points to concerns contemporary references to Enochian in popular occulture. There are, for example, a number of bands in genres spanning metal, goth, and electronica that have used the Enochian language or other references to the system in their music and lyrics. Some might also remember the mystery youtube phenomenon “Lonelygir15”, who was seen cramming the Enochian alphabet in preparation for a mysterious and sinister ceremony. The popcultural significance is indeed important and interesting, and again, it was seriously considered for inclusion (the extremely careful reader will even find me excusing myself on this very point in footnote 11 to the introduction). In the end I decided not to write about this as it diverged too much from the general argument and drift of the book as a whole. 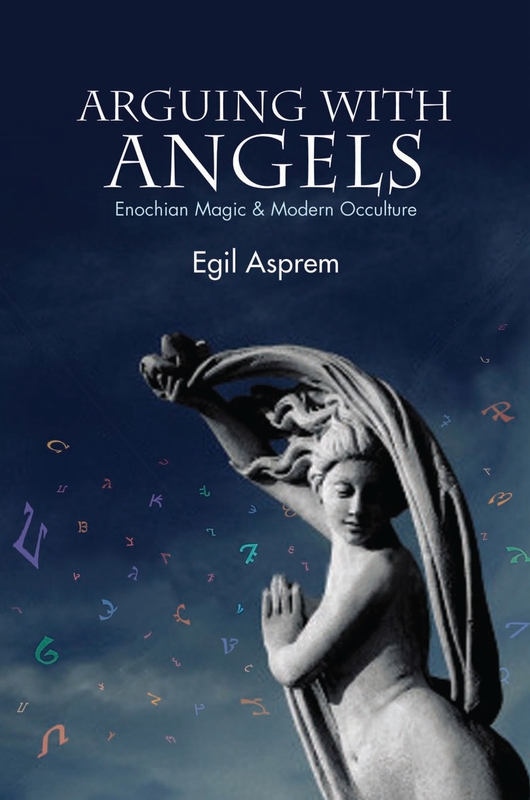 It should be remembered that Arguing with Angels is, above all, a contribution to the slowly emerging academic literature on the reinterpretation and legitimacy of ritual magic in the modern world, with the history of Enochian as a convenient case. Of course, interplay with popular culture is immensely important also for this type of research, and much remains to be done. In the present work, however, emphasis was put on internal debates and conflicts among those who truly practice magic, and less with the broader pop-occultural landscape which has been forming approximately since the 1970s. For other readers who may have missed the same things as Harms did, I hope this response helps to fill the picture slightly. This work by Egil Asprem was first published on Heterodoxology. It is licensed under a Creative Commons Attribution-ShareAlike 3.0 Unported License.